The Elite R9IR Rower is perfect for the home, small gym or Personal Training Studio, Corporate Gymnasium or hotel gymnasium. Get the body you've always wanted in the comfort of your own home! The range of "R SERIES" rowers by MotionCraft is a culmination of over 10 years of ongoing research and development which now results in Motioncraft delivering the most comprehensive range of home, corporate and commercial rowers available. 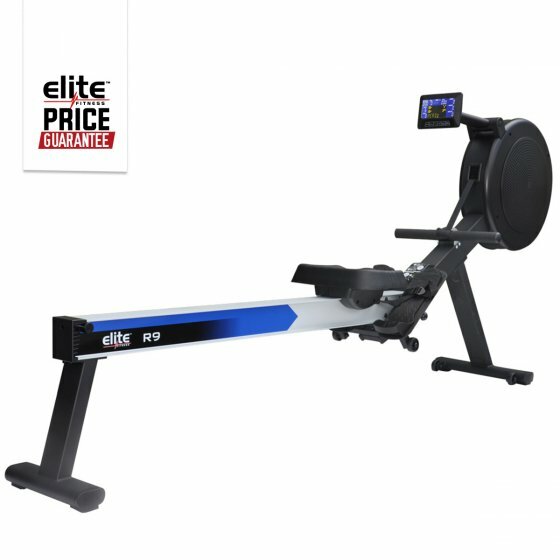 The new Elite R9IR rower features dual magnetic and air resistance with fully auto controlled resistance up to 16 levels. The durable aluminium frame and rail with a unique hinged folding ability is a definite design advantage. The R9IR Rower is based on the same design as the Concept2 Model E, boasting features such as a higher seating position and longer rail. Angled footrests situated closer together to provide a real feel of rowing on water. The R9IR also comes with a built-in HRC - Heart Rate Control receiver (strap optional) to measure your heart rate during exercise. The dual colour backlit computer display features ample programs, custom built programs and a pacer for your training needs. The Infrared Remote Control is a great advantage because from now on you do not need to change the resistance on the display during your exercise, you will do it easily using the remote control on the handle. Also, the remote control gives access to all program features. In addition, the training computer of the MotionCraft R9IR is a computer with unlimited possibilities. The MotionCraft R9IR always provides the right training to achieve your goals.